Raveon’s RV-M7 WX data radio modems are high-speed FCC and CE certified data radios designed for telemetry, SCADA, AVL, wireless data, mobile-data and remote control applications. 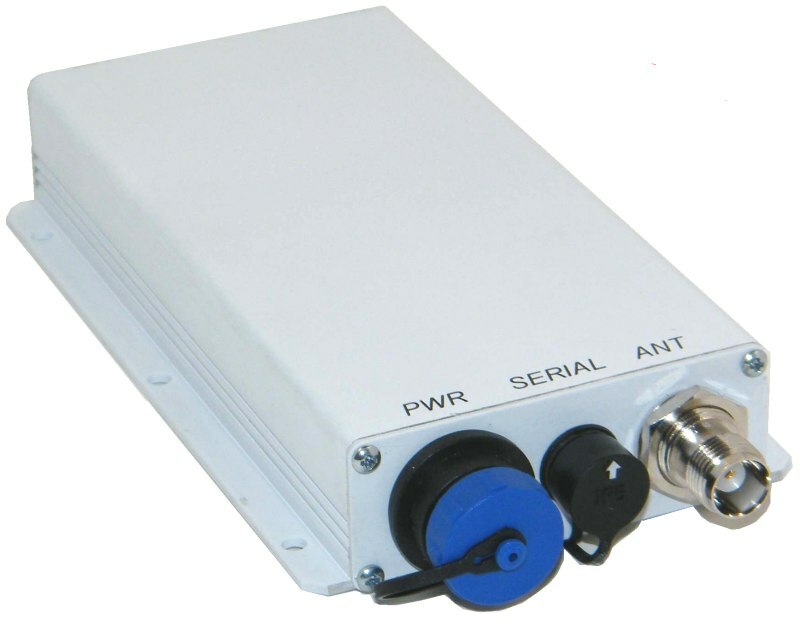 The WX version houses the M7 in a weatherproof IP65 rated aluminum enclosure. With fast over-the-air data rates and fast transmit-to-receive switching, Raveon’s M7 UHF data radio transceiver increases data throughput in narrow-band wireless systems. . Included in each unit, are advanced networking, error correction, and diagnostics. It may be ordered with an IP65 weatherproof enclosure. And because it is the only radio modem built using rugged “single-board” construction, it is extremely rugged – and cost effective. The Optional internal GPS ( GX option) enables the M7 to transmit its position, data, and status (voltage, speed, heading, temperature, I/O bits..) a pre-set intervals using either conventional carrier-sense methods or with efficient TDMA channel access. A GPS tracking system built with M7 transceivers, can track up to 20 radios with one-second updates or 200 with 10-seocond updated. The M7 is the fastest most efficient UHF AVL radio available. See www.ravtrack.com for more details on its GPS tracking and TDMA abilities. The M7 leads the industry in many areas including technology, features, and price. It has some of the fastest over-the-air data rates, TX-RX switching times, and power-on times. It is one of the smallest data radios in its class. It is one of the most rugged data radios made. It is one of the lowest power-consumption radios available. And its price will pleasantly surprise you. Real-time streaming data or Packetized operation – user configurable. Internal GPS available. Programmable update rate..
Connector Type: Circular waterproof power and data. User Manuals and Documentation: RV-M7-U Tech Manual (Technical Manual) The Technical Manual for configuring and installing the RV-M7 wireless modem. RV-M7-U GX Quick Start (M7 GX Quick-Start Guide) read this to quickly setup your M7 GX GPS transponder and configure it for use in most common applications. Technical Info: Remote Management (pdf) Built into all FireLine and M7 modems, is a set of unique remote management and diagnostic capabilities. Users are able to remotely read network statistics, configuration, and operating conditions of any FireLine or Raveon modem in the system. Competitive Features(pdf) Document AN131 describes the unique features of the M7wireless modem. Some of the M7’s features are available in other company’s products, but no other wireless modem on the market has as rich and complete set of a feature as Raveon’s FireLine. Firmware Revision Log (pdf) A list of the firmware revisions made to the RV-M7’s processor. [tabby title=”Accessories”] Description DC Power Cord. Note: Each RV-M7 WX comes standard with one power cord included with each unit. Additional DC power Cord, 6 foot AC power supply, 12V DC out, 60W, 100-240 VAC 50-60Hz input RS232 serial cable, 6′, for WX version of M7. DB9 female on one end, circular waterproof connector on the other end. Raveon’s RV-M7 WX data radio modems are high-speed FCC certified data radios designed for telemetry, SCADA, AVL, wireless data, mobile-data and remote control applications. The WX version houses the M7 in a weatherproof IP65 rated aluminum enclosure. With fast over-the-air data rates and fast transmit-to-receive switching, Raveon’s M7 UHF data radio transceiver increases data throughput in narrow-band wireless systems. . Included in each unit, are advanced networking, error correction, and diagnostics. It may be ordered with an IP65 weatherproof enclosure. And because it is the only radio modem built using rugged “single-board” construction, it is extremely rugged – and cost effective. The Optional internal GPS ( GX option) enables the M7 to transmit its position, data, and status (voltage, speed, heading, temperature, I/O bits..) a pre-set intervals using either conventional carrier-sense methods or with efficient TDMA channel access. A GPS tracking system built with M7 transceivers, can track up to 20 radios with one-second updates or 200 with 10-seocond updated. The M7 is the fastest most efficient UHF AVL radio available. See www.ravtrack.com for more details on its GPS tracking and TDMA abilities. The M7 leads the industry in many areas including technology, features, and price. It has some of the fastest over-the-air data rates, TX-RX switching times, and power-on times. It is one of the smallest data radios in its class. It is one of the most rugged data radios made. It is one of the lowest power-consumption radios available. And its price will pleasantly surprise you.